Look at me, this is my surprised face. I’m so surprised that there probably won’t be a rotary-powered Mazda anytime soon. I am floored by this news. 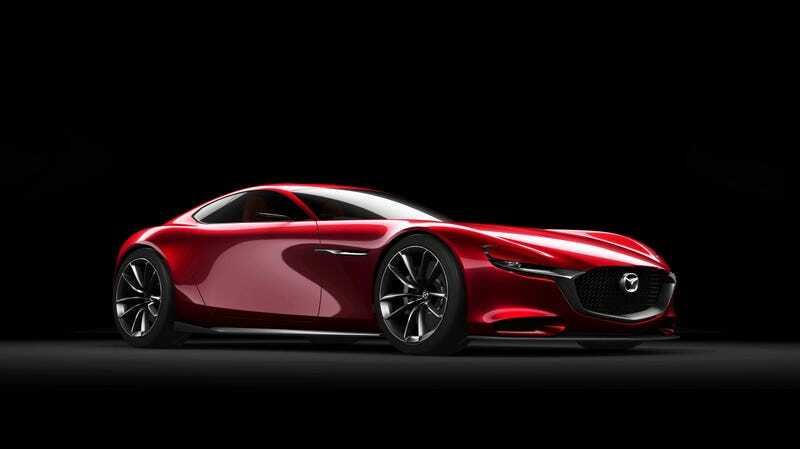 2020 was the big year that we all had our eyes on because there were rumors that it would be when Mazda would release its new rotary-powered car. The RX-Vision concept, shown at this year’s Tokyo Motor Show, stoked up the rotary fire that burns in our hearts. Speaking to journalists at the Tokyo Motor Show, Mazda’s senior managing executive officer and head of R&D Kiyoshi Fujiwara revealed that while a rotary sports car was still on Mazda’s wishlist, it had yet to make its way onto the drawing boards and computer screens of Mazda’s designers and engineers. “We cannot provide the RX-Vision to the market by 2020, because we do not have enough money to invest, to commercialise it,” Fujiwara said. We also learned last week that Mazda is considering using the magic triangles in a range extending platform for an EV or hybrid car. It’s unclear if this platform will replace the sports car. Still fine, I guess! Rotary something is better than rotary nothing. I don’t know where you’ll be when the post-2020 years roll around, but I’ll probably be here still, an old crone, still thinkin’ ‘bout a rear-drive rotary Mazda sports car. A Mazda spokesperson declined to comment for this story.